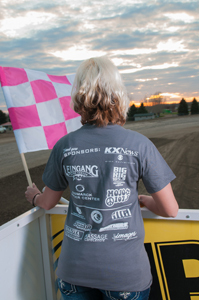 Dacotah Speedway's "Drive To Survive 6" to benefit the Bismarck Cancer Center is coming up on Friday, August 22nd. But it's not too early to get your "Drive To Survive 6" apparel and get into the "Drive To Survive" race, free. In the 2013 season we donated $8420 to the Bismarck Cancer Center Foundation. This year our goal is $10,000. 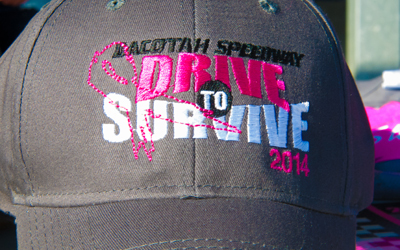 This year Dacotah Speedway is making getting your "Drive To Survive 6" apparel easy. There are several different ways to get yours and support the Bismarck Cancer Center. Click here to purchase your t-shirts and caps on our web site. Look for the Bismarck Cancer Center selling "Drive To Survive 6" t-shirts and caps under our grandstand on most Friday race nights. The limited edition women's bling t-shirt is only available at the Bismarck Cancer Center 500 North 8th Street, Bismarck. And remember to wear your "Drive To Survive 6" T-Shirts or Caps to the races on August 22nd and get in FREE.